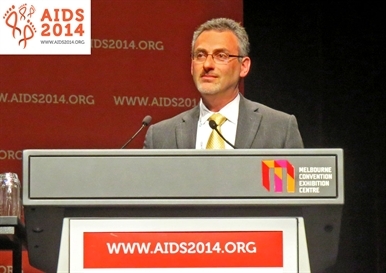 Daniel Cohen, of AbbVie, presenting at AIDS 2014. Photo by Liz Highleyman, hivandhepatitis.com. People with chronic hepatitis C who are using methadone or buprenorphine to manage opiate addiction can be safely and effectively treated with AbbVie's 3D all-oral direct-acting antiviral regimen plus ribavirin, resulting in a 97% cure rate, according to a report this week at the 20th International AIDS Conference in Melbourne. Hepatitis C virus (HCV) is readily transmitted through shared needles and other drug injection equipment, and people who inject drugs have high rates of HCV infection worldwide. Traditionally, however, only a small proportion of this population has received hepatitis C treatment due to concerns -- both real and unfounded -- about tolerability, adherence and suboptimal efficacy. New direct-acting antiviral agents that target different steps of the HCV lifecycle have brought about a revolution in hepatitis C treatment. Recent studies have shown that combinations of two or more DAAs without interferon can produce cure rates in the 90% range for most patient populations. AbbVie's 3D regimen consists of the HCV protease inhibitor ABT-450, a 100mg boosting dose of ritonavir and the NS5A inhibitor ombitasvir (formerly ABT-267) in a once-daily fixed-dose coformulation, taken with the twice-daily HCV polymerase inhibitor dasabuvir (ABT-333) and ribavirin. As previously reported, the combination cured 96% of both previously untreated and treatment-experienced patients with genotype 1 HCV infection. Daniel Cohen of AbbVie presented findings from a phase 2 study evaluating the safety and efficacy of the 3D combination for people with genotype 1 chronic hepatitis C who were on stable opioid replacement therapy using either methadone or buprenorphine, with or without naloxone. Previous drug-drug interaction studies found that the AbbVie drugs had no notable effect on methadone or buprenorphine pharmacokinetics. The analysis included 38 participants at eight sites in North America. Two-thirds were men, almost all were white and the mean age was 48 years. 68% had harder-to-treat HCV subtype 1a, the rest 1b. One-third had the favourable IL28B CC gene variant. Most (95%) had never before been treated for hepatitis C.
Most participants had absent-to-mild (stage F0-F1) liver fibrosis, but 16% had moderate (stage F2) and 5% had advanced (stage F3) fibrosis; the study did not include people with cirrhosis (stage F4). People with HIV or hepatitis B coinfection were also excluded. In this open-label study all participants -- split evenly between methadone and buprenorphine recipients -- were treated with the 3D combination plus weight-based ribavirin for 12 weeks. They were followed for 24 weeks after completion of therapy to determine sustained virological response, or continued undetectable viral load (SVR24). Undetectable HCV RNA at 12 weeks post-treatment (SVR12) is considered a cure. All but one patient had undetectable HCV RNA at the end of treatment and maintained this response through 24 week post-treatment, resulting in SVR12 and SVR24 rates of 97%. The remaining participant dropped out of the study at week 2. There were no cases of viral breakthrough or post-treatment relapse. The 3D regimen plus ribavirin was generally safe and well-tolerated. Only two participants (5.3%) experienced severe adverse events (a stroke and cancer), including the aforementioned patient who discontinued early for this reason. The most common side-effect were nausea (50%), fatigue (47%), headache (32%), insomnia (18%) and rash (16%). Two people had low haemoglobin levels -- a know side-effect of ribavirin -- but none developed severe anaemia. No participants required adjustment of methadone or buprenorphine doses during hepatitis C treatment. "The 3D + ribavirin regimen achieved an SVR24 rate of 97.4% among these 38 genotype 1-infected patients receiving opioid replacement therapy," the researchers concluded. These findings were "comparable to results previously reported in both treatment-naive and treatment-experienced genotype 1-infected patients." "A 12-week, highly efficacious, well-tolerated all-oral regimen may be an attractive treatment option for genotype 1-infected patients receiving opioid replacement therapy," they suggested, and "patients on stable opioid replacement therapy may be well suited to all-oral treatment for HCV." Cohen said that prior studies have shown that the 3D regimen is highly effective for people with cirrhosis, but interactions with methadone and buprenorphine "may be unpredictable in people with advanced liver disease." Cohen also noted that the participants demonstrated "very good adherence," according to pill counts, indicating that provider concerns about people who use drugs being unable to stay on therapy are not a reason to withhold treatment with effective new interferon-free regimens. Lalezari J et al (Cohen D presenting). Interferon-free 3 DAA plus ribavirin regimen in HCV genotype 1-infected patients on methadone or buprenorphine. 20th International AIDS Conference, abstract MOAB0103, Melbourne, 2014. Click to see the study abstract online.